Anyone who is eating for two needs to be mindful of good nutrition. There are some basics that every pregnant woman, vegetarian or not, should follow: make sure you’re taking folic acid and a good prenatal supplement, and speak to your health care provider about any specifics that might pertain to your pregnancy. Every woman and every pregnancy is different! Don’t beat yourself up about what you can and cannot eat during the first trimester (I couldn’t even look at a vegetable during this time). And of course, be sure to knock off the booze! 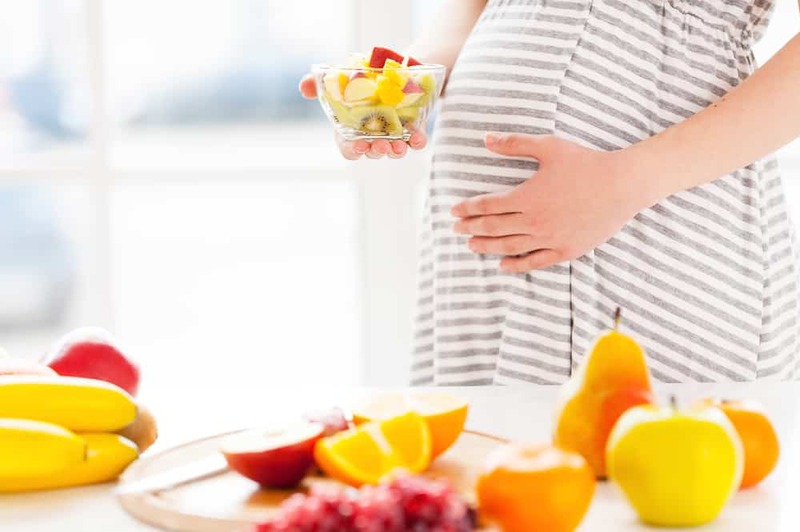 When it comes to vegetarians, armed with a bit of information and some planning, it’s entirely possible to stick with your vegetarian – or vegan – diet for the duration of your pregnancy. Most vegetarians are accustomed to fielding questions about where our protein comes from, and during pregnancy protein needs increase (for everyone) so this question becomes even more important. The average person needs about 0.8 grams of protein per kilogram of body weight. So a 150lb (68kg) woman needs about 55 grams of protein each day. During pregnancy the recommendation is to add an extra 25 grams of protein per day, which means that same woman would need about 80 grams each day. Personally I found this extra protein requirement a bit tough in the throes of first trimester food aversions, but otherwise it has been easy enough to meet. A simple solution is to aim for a 25g serving of protein with each meal, and protein rich snacks in between. I also bought some high-quality protein powder (which isn’t something I normally include in my diet) and started adding it to anything I found palatable, like smoothies or overnight oats. Your health care provider should check your iron at the beginning of your pregnancy, and again at around the halfway mark. As pregnancy progresses, demands on your iron supply increase as well. By the end of a normal pregnancy your blood volume has increased by about 40%, but blood iron levels don’t naturally increase with it, so it’s especially important to be mindful of your daily iron intake. The recommended daily intake of iron for pregnant women is about 27 milligrams for non-vegetarians, and the recommendation for vegetarians is 1.8 times higher for a total of about 50mg of iron per day. The reason for this increase is that plant-based sources of iron are absorbed less easily by the body than animal sources are. Foods like beans and legumes, spinach, pumpkin seeds, and blackstrap molasses all have iron in them, but you may need to also take an iron supplement to make sure you’re meeting your daily needs. Some health care providers recommend that all pregnant women take an iron supplement after week 20, when demands on your iron supply start to become particularly high, or earlier for those who have low iron levels to begin with. As vegetarians, you may want to also avoid having coffee and tea with your meals, as they contain tannins and polyphenols that make it harder for your body to absorb iron. Additionally, calcium blocks iron absorption, so it’s a good idea to avoid dairy within a couple of hours of taking an iron supplement. Vitamin C enhances iron absorption, however, so eating an orange or drinking a glass of juice with your supplement is just fine. Vitamin B12 is an important nutrient that you should not be without, particularly during pregnancy. Not only does B12 partner with folic acid to aid in proper fetal development, but it also plays an important role in the normal functioning of the brain and nervous system, as well as cell metabolism, fatty acid metabolism, amino acid metabolism, and the synthesis and regulation of DNA. Important stuff! The US recommended daily intake for adults is 2.4 µg (micrograms) of vitamin B12 /day. This bumps up to 2.6 µg during pregnancy, and 2.8 during lactation and breastfeeding. Vitamin B12 is found in most animal foods, including meat, fish, poultry, eggs, and milk products. Other than some fermented foods, there are very few non-animal food sources of biologically active B12. There are lots of vegan foods that are fortified with vitamin B12, including non-dairy milks, breads, cereals, meat substitutes, and some types of nutritional yeast. It is important to note that not all nutritional yeast contains B12, it must be fortified, so if you’re relying on nutritional yeast for your B12, check the label carefully. Babies born to mothers who are vegetarian and are exclusively breastfeeding may not get enough B12 if their mother is not supplementing – the American Dietetic Association recommends B12 supplementation for both vegans and lacto-ovo vegetarians during pregnancy and lactation to ensure enough B12 is transferred to the fetus and infant, as undetected and untreated B12 deficiency in infants can result in severe and permanent neurological damage. Not all prenatal multivitamins contain B12, so be sure to check and add an additional supplement to your daily regime if needed. Of the omega-3 fatty acids, DHA is especially important during pregnancy and lactation. The human brain is approximately 60% fat (by weight) and about 15-20% of all the fat in our brain is comprised of DHA. Reduced DHA levels are associated with cognitive impairment, reduced neurological development, and nervous system deficiencies. Sources of DHA and EPA include fatty fish (such as salmon, tuna, and mackerel), egg yolks, and some dairy products. Simple changes, like increasing your intake of nuts (walnuts are especially rich) or seeds (flax and chia are both great) can also go a long way in increasing your omega-3 intake. If you eat them, aim for eggs and dairy from grass-fed or pasture raised animals, which will be richer in omega’3s. The Child Health Foundation recommends that pregnant and lactating women should get an average of 200mg of DHA per day. During pregnancy, since I don’t eat fish, I’ve been taking a vegan algae oil DHA supplement to ensure I meet the recommendation. After all, fatty fish get their DHA by eating algae in the first place! Pregnant and breastfeeding women may be at risk of not getting enough vitamin D.
Some studies have found vegans to have lower vitamin D intakes than lacto-ovo vegetarians or omnivores, yet any person who does not include good sources of vitamin D in their diet or take supplements can be at risk for not getting enough, especially in northern climates where sunlight exposure is limited. All pregnant women, regardless of their diet, are advised to take a vitamin D supplement throughout pregnancy to ensure they have enough vitamin D for their baby. Keep in mind that if you choose to take the vegan supplement D2, you may be advised to take a higher dose than if you were to take D3, which is not vegan but is generally believed to be more potent. If calcium-containing foods aren’t a regular part of your diet, you may want to include a calcium supplement with your prenatal vitamins. It is, however, easy enough to meet your daily calcium requirements on a plant-based diet. Foods like leafy greens, beans, almonds, and sesame seeds are all good sources of calcium. Most adults have pretty good calcium stores, and during pregnancy your growing bundle of joy will take what it needs, potentially leeching calcium from your system. For adult women the recommended daily intake is 1000mg per day, with that number bumping up to 1200mg per day during pregnancy and lactation. Keep in mind that calcium competes with iron and zinc for absorption, so they should be taken separately. I’m glad you write about omega-3 fatty acids, they are so important during the pregnancy. Have you heard about study with pregnant women supplementing omega-3 fatty acids? Women were divided into two groups. The first one was supplementing DHA+EPA during pregnancy and lactation and the second one wasn’t. When the children were about 2 years old, scientists have checked their innate intelligence. It was significantly higher in the first group than in the second one. Although innate intelligence depend on genes, it can develop only when the child gets enough omega-3 fatty acids. I haven’t heard about that study specifically, but I know it’s a omega-3’s during pregnancy is a hot area of research these days. And so it should be! The title of this study is: Maternal supplementation With Very-Long-Chain n-3 Fatty Acids During Pregnancy and Lactation Augments Children’s IQ at 4 Years of Age. Do you want a link? Thanks for sharing this informational post! I’m bookmarking it for future (perhaps far in the future!) reference. I hope you find it useful some day!